Earlier this month, we reported that Warner Bros. upcoming superhero adventure Wonder Woman is gearing up for reshoots that will take place later this month at Leavesden Studios. While we don't know for sure if these reshoots are currently happening, we may have some evidence that they are taking place with two new set photos, courtesy of actor Said Taghmaoui. 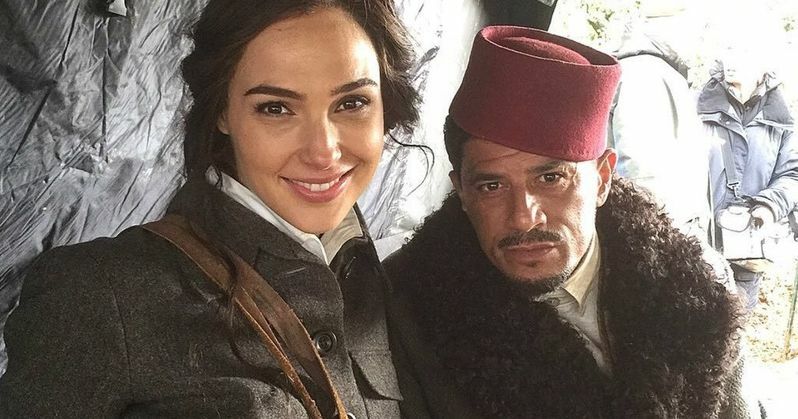 It's possible that these may have been from the original shoot earlier this year, but regardless of when they were taken, these images give us a new look at both Said Taghmaoui and Gal Gadot's period costumes, along with another behind-the-scenes image with Said Taghmaoui and director Patty Jenkins. Said Taghmaoui debuted the photos earlier today on Twitter, although he didn't offer any additional details about the images. We first hear about the reshoots a few months ago, when an anonymous person who claimed to be a former Warner Bros. employee wrote an open letter, which claimed that Wonder Woman is a "mess." However, earlier this month, Warner Bros. CEO Kevin Tsujihara said that a recent screening of Wonder Woman has made him "more confident" in the DCEU as a whole. Director Patty Jenkins also shot down rumors that the Wonder Woman movie was in trouble shortly after the open letter surfaced, calling the open letter, "made-up BS." The first trailer that debuted at Comic-Con was well-received, and, even though Batman v Superman was, as a whole, trashed by critics, many thought that Gal Gadot's performance as Diana Prince was the best part of the movie. Both Batman v Superman and Suicide Squad have been underwhelming from a commercial and critical standpoint, so perhaps Wonder Woman can give the DCEU the boost it truly needs. Wonder Woman hits movie theaters around the world next summer when Gal Gadot returns as the title character in the epic action adventure from director Patty Jenkins. Before she was Wonder Woman, she was Diana, princess of the Amazons, trained to be an unconquerable warrior. Raised on a sheltered island paradise, when an American pilot crashes on their shores and tells of a massive conflict raging in the outside world, Diana leaves her home, convinced she can stop the threat. Fighting alongside man in a war to end all wars, Diana will discover her full powers...and her true destiny. Production wrapped on Wonder Woman back in May, with Warner Bros. setting a June 2, 2017 release date for Wonder Woman. Patty Jenkins directs from a screenplay written by Gal Gadot will be joined in this superhero adventure by Chris Pine as Steve Trevor, Robin Wright as General Antiope, Connie Nielsen as Queen Hippolyta, Lucy Davis as Etta Candy and Danny Huston, David Thewlis, Ewen Bremner, Saïd Taghmaoui and Elena Anaya in unspecified roles. Take a look at the new set photos as we get closer and closer to Wonder Woman hitting theaters next summer.